BAYTOWN, Texas — Feb. 27, 2016 — After coming just short the night before, Daryn Pittman was redeemed Saturday night as he scored the O'Reilly Auto Parts presents the World of Outlaws hosted by Kasey Kahne at Royal Purple Raceway Park, his first World of Outlaws Craftsman® Sprint Car Series victory of the season. Pittman’s Kasey Kahne Racing with Mike Curb teammate Brad Sweet passed him on the final turn of the final lap for the win on Friday night at Cotton Bowl Speedway. It was the second time since the start of the season Sweet had passed Pittman on the final lap for a win. The wins by Sweet and Pittman capped off a Kasey Kahne Racing sweep of the Texas weekend. Pittman took the feature green flag in his Great Clips/Team ASE No. 9 from the front row with Sheldon Haudenschild starting on his outside. Pittman pulled out to an early lead over Haudenschild, as fifth place starter Jason Johnson in the Priority Aviation/MVT No. 41 made his way to the third position, passing reigning series champion Donny Schatz. An early caution allowed Johnson and Schatz to pass Haudenschild who began to slip back. With a track that allowed two and three lanes of racing, Johnson, Schatz and fourth-place starter Shane Stewart swapped the runner-up position back-and-forth, allowing Sweet to join the battle. As Pittman started to encounter lapped traffic, the rest of the top five closed the gap on the leader creating a five-car battle for the lead near the halfway point in the feature. Pittman increased the margin between he and the rest of the top five as Schatz worked his way past Johnson who slipped back to fifth after bobbling on the bottom of the race track. As Schatz claimed the second position, the leader controlled a one second lead with just 10 laps left. With 5 laps remaining, Schatz reeled in the leader as he set up a shootout that Pittman has seen many times already this season. Schatz tried multiple times to complete a pass for the lead on the inside, but could not build up enough momentum to complete the pass. 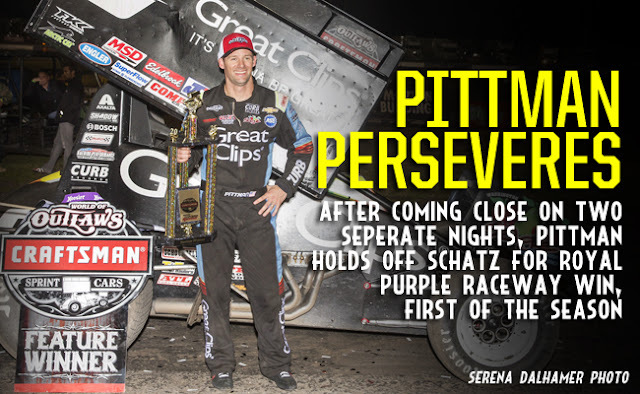 Pittman fought off the hard charges from Schatz as he held on for his first victory of the World of Outlaws season. Schatz finished second after fending off a late-race challenge from Stewart. After the feature, Schatz said his car was good and that he tried everything to get the victory but Pittman was really good tonight and they had the best car. Stewart’s third-place finish was his best so far of the season. Due to a critical failure of the electronic timing and scoring system during qualifying time trials at Royal Purple Raceway Park on Saturday night, World of Outlaws Craftsman Sprint Car Series officials made to the decision to line up Heat races based on the qualifying pill draw. The extraordinary circumstance is covered by Rule 5.6C. The World of Outlaws Craftsman Sprint Car Series will continue the western swing when the series travels to Sin City for the FVP Outlaw Showdown at the Dirt Track at Las Vegas (Nev.) for a double header on Thursday, March 3 and 4. Follow the World of Outlaws Craftsman Sprint Car Series on Twitter at www.twitter.com/WorldofOutlaws, like it on Facebook at www.facebook.com/WorldofOutlaws, or check out the latest videos on YouTube at www.youtube.com/WorldofOutlaws. RACE NOTES: Kasey Kahne Racing has won four of five events so far in 2016. Donny Schatz has the only other victory… Brad Sweet snapped his streak of only top two finishes this season, but kept alive his top five finish streak… Joey Saldana picked up his first KSE Hard Charger Award after winning the last chance showdown to get into the feature. CONTINGENCY WINNERS – MSD Ignitions ($25 cash): Ray Allen Kulhanek; MSD Ignitions ($50 cash): Daryn Pittman; Sweet Manufacturing ($50 cash): N/A; Penske Shocks ($50 cash): Donny Schatz; Mobil 1 ($50 cash): Jason Sides; JE Pistons ($50 cash): Joey Saldana; VP Racing Fuels ($50 cash): Kraig Kinser; Edelbrock ($50 cash): Joey Saldana; Comp Cams ($50 cash): Joey Saldana; Cometic Gasket ($50 cash): Logan Schuchart; Super Flow ($50 cash): Jason Sides; Sweet Manufacturing ($50 product certificate): Daryn Pittman; KSE Racing Products ($100 product certificate): Joey Saldana; Comp Cams ($50 product certificate): Daryn Pittman; Mobil 1 (20% off Mobil1RacingStore.com): Ray Allen Kulhanek; JE Pistons (Set of Rings): Travis Rilat; JE Pistons (Set of Rings): Ray Allen Kulhanek. SEASON WINNERS: Brad Sweet – 3 (Volusia Speedway Park on Feb. 13, Volusia Speedway Park on Feb. 14, Cotton Bowl Speedway on Feb. 26); Daryn Pittman – 1 (Royal Purple Raceway Park); Donny Schatz – 1 (Volusia Speedway Park on Feb. 14).